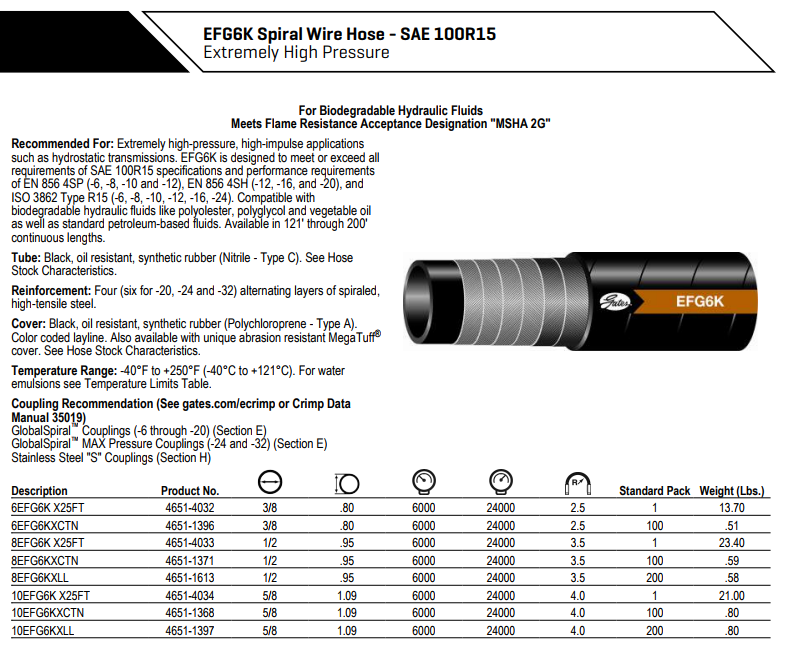 An EnviroFluid Spiral Wire Hose with a constant working pressure rating per hose id. 3,000 to 6000 PSI. 3/8 to 2″ inside diameter. 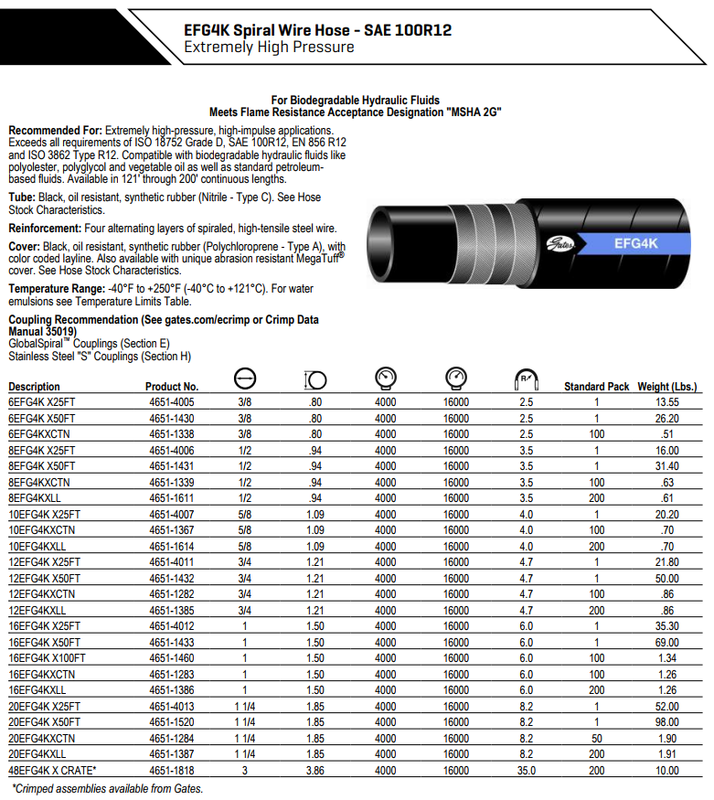 Applications: Extremely high pressure, high impulse applications. Exceeds all performance requirements for SAE 100R12 and EN 856 R12 and performance requirements of EN 856 4SP. Reinforcement: Four alternating layers of spiraled, high tensile steel wire. Cover: Black, oil resistant, synthetic rubber (Neoprene – Type A)*. Dual blue stripe with white print layline. Available with unique abrasion-resistant MegaTuff® cover. Temperature Range: -40°F to +250°F (-40°C to +121°C). For water emulsions, etc. 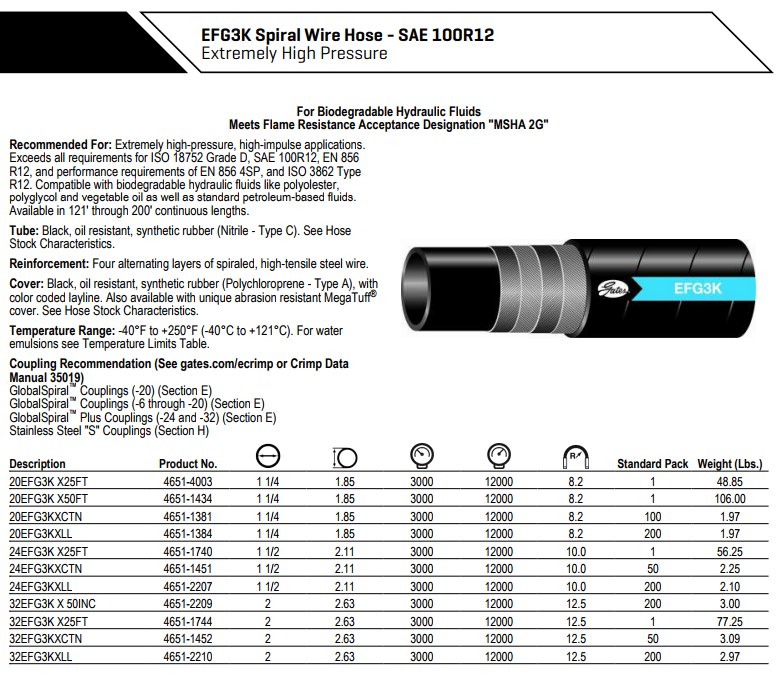 Applications: Extremely high pressure, high impulse applications. Exceeds all performance requirements for SAE 100R12, EN 856 R12 and EN 856 4SP (-16). Reinforcement: Four (six for -20) layers of alternated, spiraled, high tensile steel wire. Cover: Black, oil resistant synthetic rubber (Neoprene – Type A)*. Dual blue stripe with red print layline. Available with unique abrasion-resistant MegaTuff® cover. Temperature Range: -40°F to +250°F (-40°C to +121°C). For water emulsions etc. 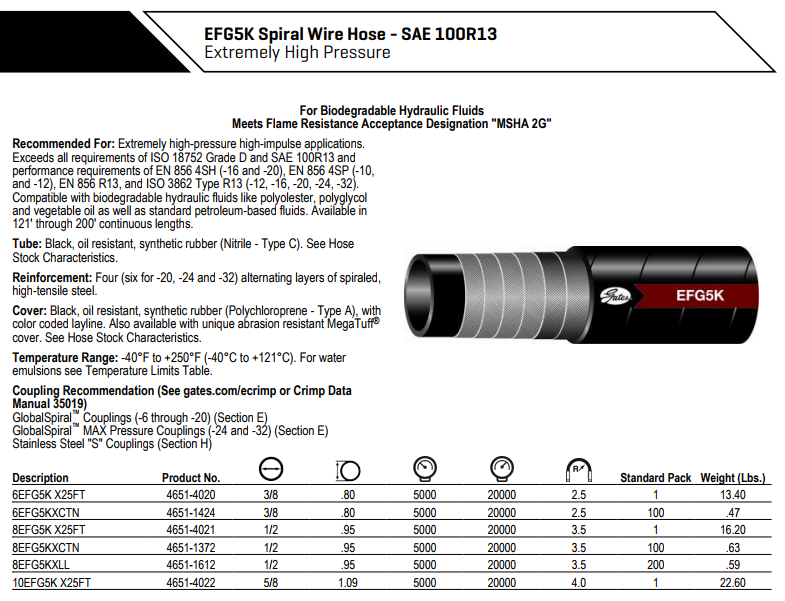 Applications: Extremely high-pressure hydraulic applications. EFG5K is designed to meet all requirements of SAE 100R13 specifications and performance requirements of EN 856 4SH (-16 and -20), EN 856 4SP (-8, -10 and -12) and EN 856 R13. Tube: Black, oil resistant synthetic rubber (Nitrile – Type C)*. CoverBlack, oil resistant synthetic rubber (Neoprene – Type A)*. Dual blue stripe with red print layline. Available with unique abrasion-resistant MegaTuff® cover. Temperature Range:-40°F to +250°F (-40°C to +121°C). Applications: Extremely high pressure, high impulse applications such as hydrostatic transmissions. EFG6K is designed to meet all requirements of SAE 100R15 specifications and performance requirements of EN 856 4SP (-6, -8, -10 and -12) and EN 856 4SH (-12, -16, and -20). Reinforcement: Four (six for -20) alternating layers of spiraled, high tensile steel. Cover: Black, oil resistant, synthetic rubber (Neoprene – Type A)*. Dual blue stripe with gold print layline. Available with unique abrasion-resistant MegaTuff® cover. Temperature Range: -40°F to +250°F (-40°C to +121°C).